Best Western Historic Frederick est idéalement situé dans le centre de Frederick. Venez découvrir et profiter de notre hôtel à côté des principaux sites touristiques. Réservation au meilleur prix et offres exclusives toute l'année. Lors de votre séjour dans ce charmant hôtel de Frederick, à quelques minutes du centre-ville historique, les choix ne manquent pas. Nous vous garantissons des chambres confortables et un accès pratique à la plupart des attractions populaires du centre Maryland, telles que le Fort Detrick. Profitez de 116 chambres et suites avec télévision câblée/par satellite, accès Wi-Fi gratuit et services de blanchisserie. Un petit déjeuner chaud gratuit est servi chaque matin, pour bien commencer une journée de détente au bord de la piscine extérieure saisonnière, de travail dans les salles de réunion, ou de sport dans le centre de fitness. La proximité du parc d'expositions de Frederick et musée du chemin de fer B&O® font toute la différence. Rendez-vous sur le champ de bataille de Gettysburg ou à l'un des nombreux festivals de vins locaux. Le festival celte est toujours un bon moment, tandis que le Sheep and Wool Festival déborde de charme. Le festival Fredericks' In The Streets et la grande foire de Frederick sont des événements incontournables. Par ailleurs, les voyageurs d'affaires seront à proximité du siège des sociétés Medimmune et Bechtel. Qu'il s'agisse d'une réunion à Lockheed Martin ou d'une conférence au Hood College, vous pourrez vous y rendre facilement. Les hôtels de Frederick, dans le Maryland, offrent une situation pratique à la sortie de trois grandes Highways : les Routes 70, 270 et 15. Toutefois, cet hôtel se trouve également à proximité de l'aéroport de Frederick, avec un parking qui peut accueillir des camions et autobus de toutes tailles. Cet hôtel est le plus proche du centre-ville historique de Frederick, et est très appréciés par les mordus d'histoire. Toutes les chambres sont équipées de réfrigérateur et four à micro-ondes pour les longs séjours, notamment pour les clients qui souhaitent découvrir les champs de bataille de la guerre de Sécession le long d'un chemin pittoresque du Maryland. Nous accueillons les groupes de golfeurs et nous leur proposons des tarifs spéciaux. L'accès au centre sportif Maryland SoccerPlex & Discovery est un jeu d'enfants. Vous serez en outre à quelques minutes à pied des commerces et restaurants, mais vous pouvez également profiter de l'espace barbecue et pique-nique à l'extérieur. Vous serez traité comme un membre de la famille dans cet hôtel de Frederick. ROACHES ROACHES ROACHES. There was roaches on the bed and wall and in the bathroom. I showed the night manager Joshi and confirmed with him the issue. I was told DONNIE the manager would call me to discuss and he didn't. I called him and he felt$26 was appropriate credit for 2 times both with roaches. I could care less about the money part but it was his attitude like he was being put out for my complaint. Personally it should have been a free rom or half off but more important ACT LIKE THEY GIVE A DAMN roaches crawled across my daughter. The hotel smelled damp like a beach also. The rug was dirty throughout hotel. If your a vet like me, BEWARE!!!! "Nice hotel, nice staff, good location"
We stayed here a night as we passed thru. It was a good location not far from the highway. The lady at the check in desk was friendly and helpful. The room was quite nice, clean and had everything you could need. It was nice they didn't charge a fee for pets here as others sometimes do. The price for the night was better than other places we stayed that were far less impressive. Overall it was a good place to stay for a night and if you needed to stay longer I think you it would be enjoyable. I'd stay here again! This is the first time I've had to stay in Frederick and this hotel was a good choice. The folks at the desk were very friendly. The room was clean and comfortable. The included breakfast was nice. Also the rate was super inexpensive. A very comfortable stay as I have come to expect from Best Western. The hotel was clean and quiet, the internet was excellent and I was able to work from my room with no problems. Friendly staff and an excellent breakfast, thank you BW! I was on a late night trip and needed to find a quick place to rest my head. Best western was a pleasant clean great location. The area around the hotel was near a business park and was very safe for my family. Arrun at the front desk is the best. He is always welcoming and friendly. He knows local restaurants and fun spots. The breakfast is hearty and full. The rooms are clean and have a very nice tv to view. Downtown Frederick has some Zavay rated restaurants. I stayed at this hotel a total 4 times this month. Had truck parking, which made my life easy, as I have a tractor trailer. Very clean, and exceptionally well maintained. This is, however, the only hotel that has ever charged me an early check in fee, as I arrive well before normal check in time (and leave a mere 10 hours later)... if my company would have continued to pay the early check in fee I would have continued to stay at this BW a couple times a week, but as they wouldn't pay the fee I was forced to find another hotel. "Clean hotel with convenient location"
Hotel is clean with easy parking. Friendly staff and convenient location. Rooms are decent with good sound proofing although bathrooms are very small. VERY comfortable beds - always a pleasant stay - breakfast is adequate too. We chose this location as it was central to our vacation plans. Our first night we did experience a few roaches, as the hotel is undergoing renovations. However, the front desk agent did move us to another room with an upgrade for the inconvenience, and the rest of our week stay was fine, outside of a slightly too hard bed. The breakfast was always hot and plentiful, and we weren't bothered too much by hallway noise. "Ash tray or cockroach party, pick your room." When I walked into our first room, a smell that took me back to the days of smoking in bars slapped us across the face. Upon further inspection of the room, there was a sticky film on most surfaces, and some pale-colored stains on the upholstered furnishings. So I asked for another room. The second one smelled lemony fresh, but sadly while I was in the bathroom I met a family of cockroaches. There were also roaches in the halls. My husband's extended family is staying here, otherwise I would leave. On a positive note, the decor is lovely and the location is convenient? Rooms very clean and bed comfortable. Although wireless internet was not working and was told had been down for several days the rest of my stay was enjoyable. I would stay at this hotel again. It is easy to get on and off I 70 and there are multiple places to eat near this hotel. Horrible front desk people. Hammerdrilling on walls at 7am.Extremely ignorant staff!!!!!!!! !I went to front desk after sleeping 1.5hr because of extreme noise and was told they posted a sign at front desk about renovations,but this is not posted online. Told to leave with no refund and my problem is not thiers. "MUSTY still !!!! just like 2016"
"Good location near downtown but needs renovated"
The hotel is in a residential area and close to historic downtown. The hotel rooms really need updated. Carpet is old, sheets scratchy and both of our rooms smelled like stale pipe tobacco; YUCK! I would NOT stay here again. Hotel is a bit dated but very clean. The room was comfortable but my only complaint is with the bathroom; toilet and tub in a very cramped space and toilet is very low making it a bit difficult for elderly people to use. Also, no elevator was available and we had room on second level which meant navigating the stairs. The best part of the stay was the breakfast. Many choices including fresh waffles, eggs, sausage and potatoes along with regular continental breakfast foods and fresh fruits. Price was reasonable and staff friendly. Room had mold by fridge, bed bugs bite my husband severely. Smoke alarm went off at 3:45 a.m. because it needed a battery. We had no idea until Monday after my husband went to his Primary Care Physician what the rash on his body was about, or I would have gathered better evidence of the bed bugs. 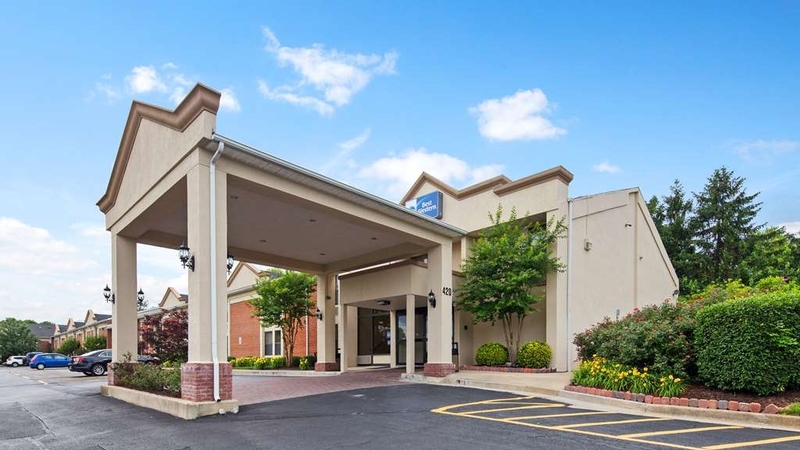 "Excellent Location, OUTSTANDING Front Desk Service, Average Sized Room"
First off, the location of this property is Excellent. Its at the intersection of I-270, I-70 and Route 15 which is the main road North into Gettysburg and South Central Pennsylvania. Good location for a hotel. As far as service, the lady at the front desk saved my bacon. I made a last minute trip to this location and she was able to put me in a ground floor room that I needed due to orthopedic issues. It was a weekend. THANKS. You saved me a 4 hour trip home after a long day driving. As far as the room, it was the entry level double. It was small by Best Western standards but it was clean, quiet and everything worked. This hotel is old, but they are in the process of remodeling some rooms. Our room was very clean and comfortable, the staff was excellent, and breakfast was very good. It's reasonably priced too. We had family members in several rooms and everyone was satisfied. We had a very clean King suite with couch and coffee table. The bed was comfortable and the bathroom was nice sized. Everything in the room was in excellent shape. Full HD Direct TV. Very good breakfast selections. This hotel is great as always. Staff goes above and beyond to make sure your stay is wonderful. New breakfast menu is something great and new to try. 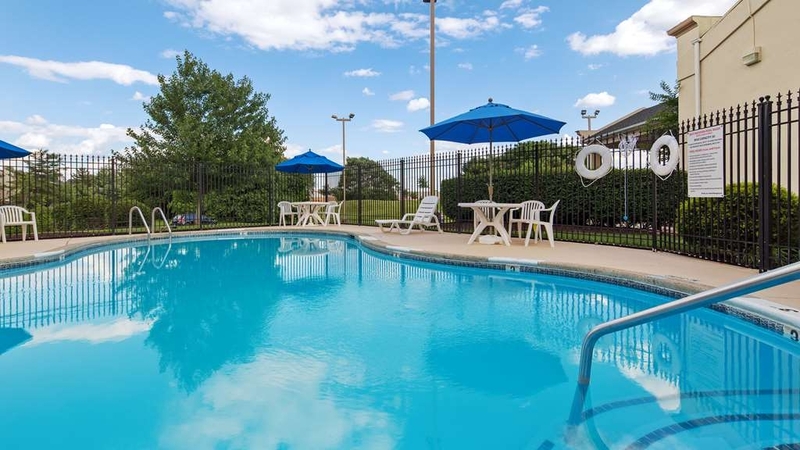 Outdoor pool is spacious and is open each day of the week. Hotel was awesome. Hot breakfast, many options to choose from. I loved the potatoes at breakfast great addition to the fluffy scrambled eggs and sausage. I will be coming back to stay again. Overall great job. This BW was a nice place to stay. Staff was nice and friendly, breakfast was good as was the location. I would stay here again in future travels. My only suggestion is to have a designated smoking area away from the front entrance. Nice hotel in a nice area at a nice price...NIce! Staff was friendly, hotel room was clean and breakfast was available. We only stayed one night on our way to the east coast, but it was worth the stop. The stay was good. The hotel was clean and quiet. Some reviews said it was not but I believe it depends on what part of the hotel you stay at. We were closer to the front so it wasn't right next to the highway. Sadly we didn't get to try the pool because it was locked due to rain our whole entire stay. The bathroom was a little small but fine for a person to use. The room we were in was a king suit to me it was an average size room nothing “suite” about it but for the price in the neighborhood was too good to pass up. It is also pet friendly which is great for the future when we want to bring our two fur dogs with us. Overall we liked the hotel and will go again soon. "Loudest Hotel I Heve Ever Stayed In." We arrived around 9 pm and the parking lot was full of big trucks and work vehicles....just had to make our own space unfortunately. There is no elevator in this motel so we had to lug our belongings up steps caked with dirt. The room wasn't terrible. It was amazingly clean and well kept. The bathroom, however, was so small that I could barely close the door to use the restroom and I am not a large person. The most ridiculous thing of the stay was the noise from the interstate. I am a heavy sleeper but I could not sleep through the noise of cars passing by at all. I had the worse night's sleep in a hotel ever and I stay at many hotels. The breakfast was subpar, definitely below Best Western's standards. This motel was not any better than a Super 8 but still has Best Western prices. For a good night's rest, it would benefit you to seek elsewhere. great hotel, great staff, i would definitely come back. everything from the breakfast, to the internet was great. pool was crystal clear, open, and in great condition. My room was very clean and comfortable. To be truthful I was not looking for perfection for the price. I was just happy to see the room was clean. However, there were no drinks to be found in the hotel. The machines were all empty. They do not have any coffee on after breakfast. Also, there are no elevators for the entire place. There is a shopping center and grocery very close by as well as some restaurants. The bad part was the bathroom which was so tiny you could barely get in and out. The toilet was right next to the tub and the door opened inward. You literally had to step around behind the door. The sink was out in the room. It was not ideal for sure. The hot breakfast was good and adequate. Coffee in the AM was good and front desk staff were very pleasant on check-out. I think I would pay just a little more next time due to the reasons I mentioned and have an elevator and a few extra amenities like coffee. "Forgot to book this hotel"
I thought I had booked this site. Thank goodness they had rooms. My sister was tired. So I called the rewards site. I was able to get the room for less using the Best Western site. Tried the computer and it did not work. The internet still did not work once in the room. My sister said the room smelled musty, but I did not notice it. The parking lot was too full. No elevators. McDonalds down the street. Comfortable night sleep and breakfast was not bad. The pool was closed because of rain. "Everyone wants perfect! But in this imperfect world, this entrepreneurial family is working hard to improve it!" Hotel is downtown - so you get downtown with the hotel. It is close to the interstate highway, close to shopping and restaurants. Front desk was attentive to our arrival (and the others coming in at the same time), though late. Was given a room, and we started to move in but found water on the floor. They moved us to another room with little fanfare, and reduced the price for our trouble - a smart move on their part. The property is dated, but functional. Every hotel has its quirks (doesn't matter if it's $ or $$$$$), and this was no exception. Breakfast was ample and had plenty of traffic. If you're a perfectionist and work for Michelin, steer clear. If you're looking for a reasonably priced room you can live with, this is your place. "Bait and Switch and TOTAL DUMP"
They knowingly have false pictures of the room types on the website. I booked two of their King Suites. They only have 1. SO they also knowingly overbook. The General Manager said I was wrong a booked the wrong room. Screen shots of their website and my reservation are attached. I have also attached a picture of the gross room we got. The rooms are gross, with a picture of the pullout couch mattress attached. FIre hazard daisy chained extension cords in every room, and running the length of the hall ways. Their customer service was awful. He finally agreed to comp one of the rooms, and gave me a receipt that he did. Then they recharged me. Best Western customer service is useless and doesn't do anything. I was not very happy with my stay. I have stayed approximately 200 nights at a hotel in the last year and this was the first one to charge for an hour early check-in. The hotel is extremely loud because all the metal doors slam shut when closed at all hours of the day and night and it backs up to a freeway. The mattress is a joke. I have slept on floors when I was in college that were softer than that mattress. The pillows were approximately airplane size. I am giving 2 stars for the breakfast (which was OK, nothing great) and high speed internet which worked well. The value was so-so, I would have rather spent another $10-$15 for better accommodations. We stayed one night. The hotel staff were helpful. Our room had a small bathroom & small sink (not much room for toiletries). The room was poorly lit. Our bed was harder than we like. The breakfast was pretty good. The price was good. Stayed here while visiting my son. 4 adults in the room and plenty of room! Breakfast options were good, if a bit thin in the fresh fruit arena. Bananas and apples and oranges, but blue berries and strawberries for cereal would be great also! Coffee is hot and plentiful! "Affordable rates and clean room"
We chose to stay here for a night of rest from a long day of travel. 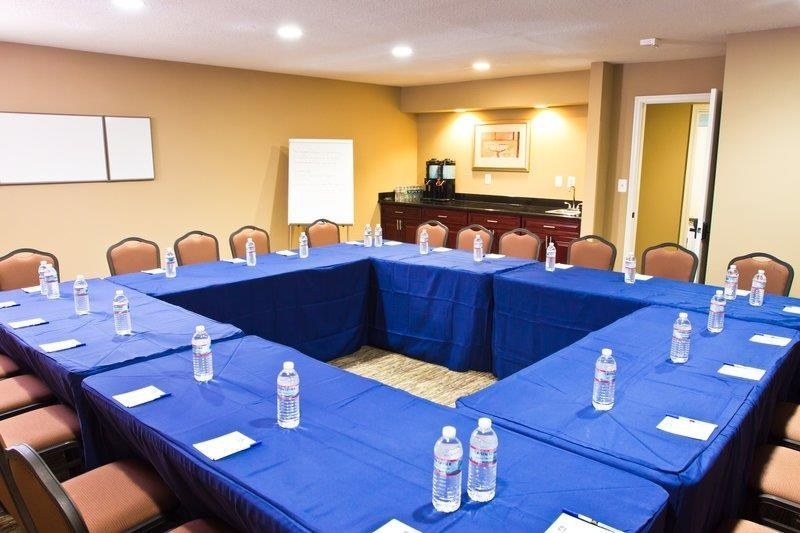 We found that the room was very clean, and the staff was exceptional and welcoming. We will absolutely choose this hotel again on our next trip through! "Very tired when we arrived"
We had been on the road for over 10 hours when we arrived. The staff was amazing in getting us two rooms together. The rooms and the bathrooms were very clean, the rooms also had a nice clean scent to them. Our entire group (six in all) really enjoyed the full breakfast. If we ever brave the area around DC again we will be coming back here. We found the beds very comfortable. We've stayed here before and were happy then and would do it again. The hotel itself is a little difficult to find. We've stayed for many years when it was another hotel so I knew where it was but there are two streets with the same name. One is a street and the other is a Blvd. This one is on the Blvd. "Price ok, close to area"
Room smelled terrible ... front desk gave us a spray bottle of something to make the room smell good.however the morning cleaning crew took it so the room continued to smell like rotten feet the 2nd evening. This hotel is a great find! After a long drive we were greeted with excellent customer service and a smile, from our late night check to our morning breakfast and check out! The employees were all so friendly and helpful. The rooms were spotless, quiet and comfortable! I would definitely stay here again. The Breakfast buffet was an unexpected and welcome delight. From the hot fluffy eggs, to the juicy sausage and potatoes and don't get me started on the individual fresh to order waffles, yum! It's a nice quiet location with easy, close on/off access to the interstate. I highly recommend this little gem! "Easy access to the Interstate." The hotel and room were very clean. The amenities were good. The bed was a little hard and bouncy. Breakfast had hot and cold items and was kept replenished. I loved that the rooms had hall access only and the openings were locked. Overall the motel is nice and the value for the money was above average. Breakfast was not served until 6:30 so I could not take advantage of the continental breakfast. Staff was nice and location was suitable for my business trip. Stayed one night in February 2018 as a stopover on way to port of Baltimore. paid just under $70 with BW rewards rate. Bathroom was very small and sink is outside of the bathroom. Water pressure and temperature were great. Room is looking a bit tired. Couch had a few stains. Mattress was very comfortable. We walked to the local grocery store and were asked for money by peddlers. Hotel is next to freeway so those rooms would not be quiet. If some one was talking outside our door in the hall their voice carried into the hotel room. Check in/out employee was very courteous and pleasant. We would not stay here again because of the location. We picked this hotel for the BW brand. Room was clean, comfortable, and the price was just right. Will continue to use this hotel on my visits to Fredrick, Maryland. Read the many reviews for this hotel, everyone except Sara had a good stay. This was my second visit to this hotel, will use this hotel again on my next visit. "has been very consistant over the years"
Bed sheets had not been changed and smelled of previous guest. I also came away with 10 bug bites on hands and upper back. I reported the smell on the sheets and was told the room had been cleared by the housekeeping supervisor. I did not know I had been bitten until the bites started itching the morning after we left the hotel. "Good Location, not well maintained"
"On Our Way to DC - 2nd night"
We arrived early afternoon. Our greeting was good and checkin was easy. Our room was clean and quiet. Our pup was welcome and there was no issue with her being left while we went out to have dinner as long as she was crated. Breakfast was very nice and our checkout was swift. 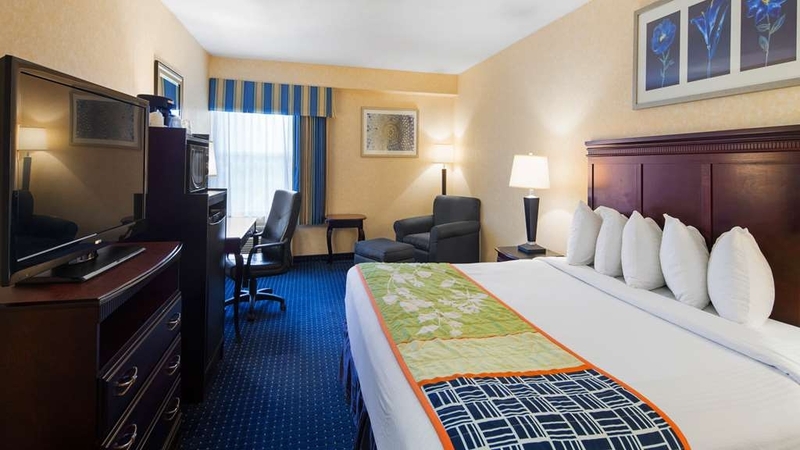 "Hotel is amazing and great location in Downtown Frederick"
This is a great hotel and employees were all so helpful. I will stay here again. Breakfast was always hot and fresh. It's a quite location. My room was clean. Everyone had a smile on their face. I felt welcomed when I arrived. "I had a pleasant experience on my business trip"
This hotel have an excellent staff at front desk and housekeeping department. I was impressed with this hotel's location and quality of lobby and rooms. Overall they had very best breakfast with many choices. I will stay at this hotel every time I visit Frederick area. Staff was very courteous and helpful. Recently remodeled and looking good. Convenient to all of Frederick. We have stayed here three seperate times snd each visit has been great. Would recommend this hotel to family and friends who are visiting. Stayed the night in Frederick for a hockey tournament. Hotel was clean and conveniently located. Staff was friendly. Room was just OK; lacked comfort with bed/pillow and space in the bathroom. Amenities were adequate. Breakfast was also OK and was offered early 6:30AM. There must have been something going on that weekend, many of our favorite hotels were booked and this one was packed. Rooms are dark and dingy, sheets on the bed are the most uncomfortable sheets I have ever slept on. Bathrooms are very small. I have to agree with the other reviewer, think airplane. I didn't even bother to shower there, felt like I would be more comfortable showering at home. Breakfast was packed - since we don't eat processed food - we went elsewhere. The Waffle House - was close, they serve real food and no one was there when we arrived. Will never come back. Nice hotel. I stayed one night. The room was clean and amenities plentiful. The staff was courteous and efficient. The breakfast was standard across the industry, which is to say not the best. One gets the impression the cooked food is frozen or from a box. It's edible, but nothing special. The price was reasonable. I would stay here again without any qualms. Of the 3 BW's I stayed at on my trip, this was the best. "Is this a church or a hotel?" We were woken up on Sunday morning by a vey loud and obnoxious “Christian” church service that apparently uses this location as a church. This includes amplified church music! We arrived the night before in the rain. The room is small. The bathroom is so small that the sink is in the room not the bathroom. We will never be back to this location! I didn't pay to go to church! Waited 10 minutes for someone to show up at the front desk at check-in. Room was small but adequate. Bathroom was very small (Think Airplane) Not even room to hang used towels and the rooms were noisy due to very thin walls between the rooms. They had the facility as clean as they could and breakfast was included. just ate waffle and peanut butter, as that's all I trusted to eat. Bed was OK. I'm sure you could do better elsewhere. I would have given zero stars if I could, this hotel was honestly the worst I have ever stayed in. I travel for work and pleasure over 10 times a year and have stayed in 5 star hotels and then this one. BEWARE it is RIGHT on the line of the freeway and the noise level is so high that my husband and I were trying to sleep with pillows over our heads. I made this reservation well in advance and only because it said in Historic Frederick, but I kid you not people, the constant freeway noise was the worse. Shame on you Best Western for not doing whatever you could to muffle the noise, triple pane windows, SOMETHING. I wish we wouldn't have been so tired when we finally got to the room for the night to ask for a change, but I really don't know if it would have helped because of how the hotel is situated. It really ruined our trip and we were dead tired the entire next day, so please don't make me tell you I told you so...stay away from this one, there are many other nice hotels OFF THE FREEWAY. Went to historic Fredrick Best Western for a friend's wedding. The place is older but clean and staff are friendly. Breakfast was free and good. I would stay again. Lots of people there so it seems like a reliable place to stay. "WILL NOT STAY WITH BEST WESTERN AGAIN"
Absolutely disgusted by this hotel. Traveling with my newborn 2 weeks postpartum and the power went out at 4 am and still wasn't on when I checked out at 11. No light to not only take care of the baby, but no light to check/take care of moms stitches either. When we realized the power was out at 6 am, we went to the front desk to see if it was just the room or the entire hotel and were informed it was the entire block. We asked if that meant there would be no continental breakfast, the girl very rudely said "well go to mcdonalds... you can bring me something too." My boyfriend got back to the room and told me this is what she said and annoyed I went back to the front desk... well this time she was out front smoking a cigarette and there wasn't even anyone at the front desk. Also at this point we noticed the exit signs weren't lit up and the emergency lights in the hallway never came on with the power outage. Our basic safety in this hotel wasn't even cared for. I called best western corporate and said how horrible the staff was, the safety concern, and how unhappy I was that I paid for the amenities I wasn't getting because of the power outage. I was very understanding telling them I knew that the power was beyond their control but I was frustrated as a paying customer. The woman said she understood and agreed the front desk's comments were uncalled for. She then told me she would refund me if she could but it had to go to the front desk staff first and filed a report- said that even though it was a best western, best western technically wasn't responsible for the individual hotel and they would have to deal with the issues. This I found very alarming because I paid extra to stay at a best western rather than stay at a not recognizable hotel chain, as I've done many times before. I expect to pay extra for a best western not just because the name on the building but because they typically stand for better service and more reliability. If they have no consistency between franchises & they don't uphold the same standards, then there is no point in paying extra for the best western name. (& trust me, I won't ever again). I went back and dealt with the rude staff again, making my concerns known. I asked for the manager upon check out and it turned out the front manager was actually the rude girl from before (lucky me). I explained that I understood it was beyond their control but asked if I would have any compensation for the terrible experience and the fact I couldn't use the air conditioner, had no hot water, etc. etc. and she said that she couldn't do any refund or partial refund for the inconvenience or lack of amenities and then rudely said, "you know I'm working in these conditions too". She seemed to not understand that her sitting there talking to another employee, doing nothing, while getting paid was a little different then me paying nearly $100 dollars for a room and getting this result. Also, more so than the money it was the struggle that it caused me and my newborn being without power and hot water that was frustrating for me- which she had no compassion for. I called corporate back and complained again, this time asking for a supervisor when again my concerns for safety and the exit signs & emergency lights not coming on was dismissed. Supervisor 'Mike' got back on the phone with me and proceeded to tell me that they had a week to resolve the issue and that he would reach out to the general manager of the hotel instead of the front end manager that I had spoken with and he would personally call me within the week to resolve the issue (& that he would ask the GM about the emergency lights). Never did I receive a phone call. I waited two weeks and called corporate again, I was dismissed and told that it wasn't there fault the power was out so no compensation would be given and shooed off the phone. When I did also mention the safety concern of the exit signs and hallway lights being out I was again dismissed and told that she was sure someone checked into that but would make a note. No one seemed this entire time not only to care about the horrible service, the services I didn't get as a paying customer, or the fact that there was a major safety issue. ABSOLUTELY DISGUSTED BY BEST WESTERN & the fact that I found out their name means nothing, no quality standards or accountability. I will not be staying with best western again and I urge you not to bother either. The problems started as soon as we checked in. They gave us a room and our key. We got all our belongings and walked to the room which was still being cleaned?! How do you let someone check in if the room is not even finished? We waited for about half am hour in the parking lot and checked back, it was finally finished. They did a horrible job. There is still hair on the sheets (obviously not new linens) and dirt on the bathroom floor. Speaking of...the bathroom is incredibly cramped and tiny. Here it is 930 at night and there are constant doors slamming shut and non stop loud talking in the hallway. I would not recommend this hotel and will not be back. Our entire family booked rooms at this hotel as we were attending a family wedding. When we arrived hotel had no power. We were not able to check in. Around 5:30 pm they allowed us to check in. The rooms all smelled of mold and mildew. It is the first thing that hit you smack in the face when entering the room. The bathrooms were cramped and the tubs all had peeling paint in them. Very dirty. The breakfast consisted of rubber eggs and was so crowded we couldn't even find a place to sit . We complained to the management about the smell of the rooms and was told they could do nothing about it. Very poor customer service. I will never stay in a Best Western again. Our stay at the BW was interrupted by a power outage. The staff did a fine job to keep the coffee perking and food available. Our room was clean and the bed was very comfortable. The Wi-Fi worked well and it was easy to be connected. I enjoyed my stay at this BW. As with everyone else - the bathroom was very cramped. Aside from that, our stay was great. The breakfast wasn't bad and we didn't have problems staying connected. I had an issue with trying to get a drink out if the vending machine and the girl at the desk not only refunded my money but gave me two bottles of water which was very nice. It is a bit dated for the price but overall we enjoyed our stay. Beautiful Hotel with a great breakfast and dining room with television. Professional Staff that is service conscious and responsible. Locale is only 39 miles from Baltimore. If you're planning to stay in Frederick BW is only 1.9 mIles from downtown. "Hampton Inn Prices With Motel 6 Amenities"
Sitting at the screen wondering where to begin. I'll begin with the toilet paper. When we checked in there was two rolls of paper that was almost done. When I went to the front desk to ask for a roll, the clerk asked me for my room number and then went on the computer. I was so perplexed that I asked him was they gone to charge me for the toilet paper. When I did go to the bathroom I immediately came out and went to my tablet to again look at the picture of the beautiful bathroom posted on their website. My stay went downhill from there. Between the loud fridge and air conditioner, the lumpy pillows, the Wi-Fi that I had to keep putting the code in to get on the internet, to the rotten fruit they kept serving at breakfast made my stay a nightmare. I'm not even gone to talk about the broke down fitness center. And what is a $2.00 EcoStay Program charge on my bill. But the topper was, my bill was $245.98 for two night stay but $264.18 was put on my credit card. The Manager was very helpful and proactive.The staffs were very helpful.Rooms are clean.Checking was quick and Ashley explains my billing properly.I like the rate and the hotel is closer to everthing u need. Nicely rennovated/updated hotel. Very convient location. Room and bed was nicely done and comfortable. Breakfast was the same every day, no variety at all. Exercise room had three machines. Stay in an odd number room to be away from the road noise. The breakfast was hot and delicious: eggs, sausage, hash browns, waffles, fruit, yogurt, cereal, milk, pastries, coffee, juice. Our family was gathered for a wedding in Frederick, and we used the lobby at night to gather together and talk/share memories. Service was great. Room was comfortable; we had the King suite so it was roomy. This is an older hotel, so the bathroom is small. I would not recommend it for large people, average size is a better fit. We only stayed one night. Even though it was a pretty full hotel, it was quiet. A lot of guests were in town for a wedding. The hot breakfast was good and well stocked. They offered waffles, scrambled eggs, sausage patties, the usual pastries, instant oatmeal, coffee, and some juices. We will probably stay here again. I stayed in a King Suite with a pullout couch. The room itself was nice (it was nice to have a separate sitting area). For the most part, the room was clean, but the tub could have used a could scrubbing or replacement. The floor of the tub was brownish and dingy. You could also see water marks on the shower walls. The bed is a little on the hard side, but I like that. That aside, I was satisfied with my stay. I didn't partake in breakfast, so I can't say how that was. Very clean, hospitable quiet hotel. Near the sites downtown. Only drawback, our room had a tub without a stopper, so limited to showers. We try to stay with Best Western whenever possible, we find no two alike and like to stay in places that aren't cookie cutter. Room was clean and adequate.Breakfast was OK . Not a lot of variety Bathroom was ridiculously tiny. We got in very late and were passing through. Check in was fast and we had no problems with anything at this hotel Check out and on the road was quick and easy. Didn't eat much at the breakfast area not a lot to choose. Not many healthy options. "Terrible Front Desk Service at this Hotel"
"Solid hotel for quick overnights"
Hotel was not luxury but doesn't bill itself as one. Satisfactory room though super, super small bathroom. Also, I requested a roll-away bed when I made the reservation and when we checked in was told they don't have roll-aways which made it a little difficult as we were travelling as a family with two teenage/adult children (brother and sister). We wouldn't have reserved here if we knew that wasn't an option. Continental breakfast was very good and breakfast room staff was very friendly and accommodating. "Good value; light on amenities and presentation"
We got a great deal at $904 for 5 nights for a double room suite with free breakfast. AC was cold, beds were comfortable and TVs worked in HD. It was great for the active vacation plans we had planned for the week. We just needed a safe place to sleep at night. Aside from that - don't expect anything more and you'll be satisfied. WiFi did not link up and could not get help, B-fast was the same every morning and below average quality, rooms do not look like the pics online and neighborhood is a bit sketchy. "I got what I paid for..."
First off I am a Best Western rewards member, and booked this trip through Travelocity because it was three dollars a day cheaper. Having said that, on check in the front desk clerk was rude and not caring. Our room (143) was small and clean, but very poorly put together. Things were literally falling off the walls. The bathroom was so small that you had to literally step into the tub with 1 foot to shut the door behind you. No joke. The breakfast was very basic but OK. The TV was brand-new and had a sharp picture in the refrigerator was already turned on and running nice and cold when we got there. All in all it was not bad, just could have been a little better kept up. Note : when we checked in there was almost nobody there on a Sunday and when we checked out the following Friday the place was absolutely packed. The rest of the staff was very friendly and helpful. Overall the stay was satisfactory. The weather was extremely hot outside and our cooling system in our room was not working well. We struggled to keep the room cool even with the drapes closed. The entire hotel needs an update. We booked here because it was close to family we were visiting. But was very convenient lots of good restaurants within a short drive. Would stay there again. Breakfast was sufficient, eggs, hashrounds, sausages, waffles. Service was excellent. "Nice hotel ... BUT ..."
Overall, I liked this hotel ... The staff was very nice, the room was clean and the bed was relatively comfortable ... BUT ... the room was on the small side, the bathroom was ridiculously tiny and the air conditioner was working intermittently and was straining to keep the room cool. "Your average hotel with a decent breakfast - but no elevator"
This BW property was extremely convenient to all my client sites; Room Accommodations were very good and price per night extremely reasonable. All staff very friendly; Breakfast "bar" provided was of good quality and selection was varied. Plenty of time to resolve the spinach pool, but to no avai.....3 day stay with no pool, which is the only thing to do at this hotel. We all called earlier to confirm our rooms but no one told us the pool was unusable...we checked in and they told us then, when it was already too late to change. they then told us they would comp us a night on our bill, and that never happened either! Needs complete renovations on the first floor due to mold, mildew and smoking. Food was like warm, dry and tasteless. The check-in associate did go to three or four rooms before finding a clean and non smelling room on the second floor but it was right next to the conference room and main staircase. Everyone at this hotel was polite. Very clean hotel. Quiet nights sleep. Full breakfast. Easy off and easy on to the highways. This was our first time staying at a Best Western and we were impressed. We were happy with our stay. "Made a Mistake Booking this Hotel!!" We arrived after a day of travel with a toddler to find we had to carry items to the second floor with no elevator. The hallways were dark and not air conditioned. The rooms (King Suite) were cleaned, but had workers installing Direct TV in the rooms when we arrived at 7:30 pm. We turned on the room A/C and it took the better part of the night to reach an acceptable in room temperature. I actually cleaned the filthy filters myself to help the a/c work better. We booked this hotel because of the price, breakfast and a pool. The price was to high for the quality of the rooms, the pool was out of service, the breakfast was nothing fancy, but a typical hotel breakfast. The bathroom was very small, no closet in the room and the odor of stale cigarette smoke was apparent in our non smoking room. During our stay we experienced the smell of someone smoking marijuana and the local police being onsite. The best part of our stay was checking out. I will say the front desk staff was pleasant when we checked in. "Ill tempered manager with bias towards seniors." Alea, sales manager, rude, obnoxious, unprofessional. Prejudice towards senior citizens. Demanded we stop our conversation that was focused on travel plans for the day. Threatened to have us removed if we didn't stop our conversation. Pro: price was in a good range, offered free breakfast and has a pool Con: breakfast food was way over cooked, pool was cloudy(and made me worried about the cleanliness), bathroom was EXTREMELY small. Also, as soon as you walked out in the hallway there was a strong pot smell. Don't know that I'd bring my family back to this hotel. "Better Options in Frederick, MD"
I decided on this hotel since I had enough reward points to stay here for free and I was in town for my niece's wedding. However, I had the 2 worse night's sleep on a brick bed and the pillows were the worse too. In order to get to my non-smoking room, I had to walk down a corridor of smoking rooms. I noticed the next morning that outside my room, the hallway also smelled of strong smoke. I felt the hotel's workers were always watching me, whether I was going out to my vehicle, filling up my ice bucket or walking down a hallway. Creepy if I may say! I should have gone to another hotel and paid. Hotel smelled musty. Air conditioning could have been much better. Front desk staff not too friendly. Cleanliness was below standard compared to other hotels that I've stayed in. The bed was comfortable. Decent selection of breakfast food although didn't taste the greatest. Good water pressure in the shower. Wouldn't stay again, seriously. None of the ice machines worked. Good and friendly location and accessible to everything in the Frederick area. Great availability of restaurants and stores and recreation facilities in the region. BW has done a great job keeping the brand looking good with this hotel. Very good choice if you're looking for value for the cost. Room was very clean, noise level very low, staff were very accommodating. Breakfast was adequate..numerous choices. Excellent location for anyone interested in touring historic Frederick or the immediate area. Very bicycle friendly area. The whole hotel was extremely clean and well decorated. Everyone of the staff was professional, helpful, kind and friendly! The breakfast bar was one of the best! The food was hot and delicious! There was a large variety of foods to choose from. The staff was constantly restocking the food! Go stay at the hotel! I have already booked 10 rooms for our reunion in 2018! "Wish I would have checked reviews..."
This hotel isn't in the best of locations for enjoying the historic district. It was in the back of an old neighborhood that I wouldn't go walking in. The room was just yucky "damp"! Breakfast was just okay. 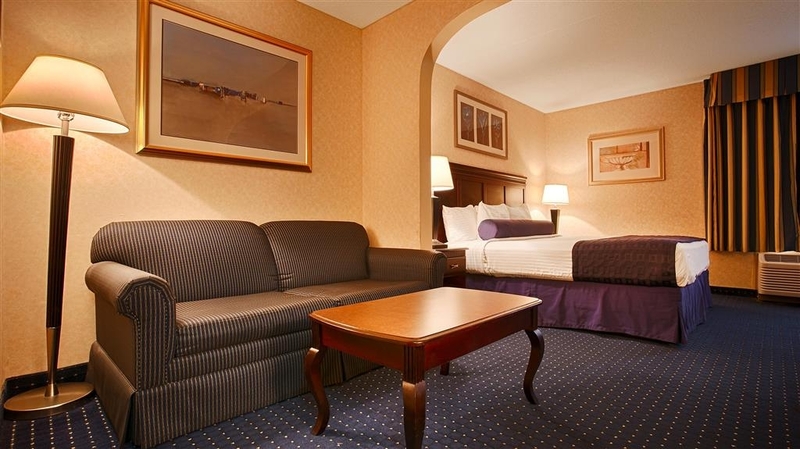 "this hotel is close to downtown Frederick, MD"
The Best Western Historic Frederick hotel is in a convenient area. the Weis grocery is within walking distance. Ledos Pizza is in the same shopping center and we love Ledos. the hotel is close to downtown Frederick and there is a lot of history in the area. We were given a welcome call the day we were to arrive. They were busy when we arrived but it moved quickly. The room was clean and nice. The only thing was the bathroom was small for this being a suite. The breakfast was standard fair and good. Close to downtown, 2 miles. The lobby staff were very friendly and helpful. "Room fine lots of highway noise"
The hotel is dated, and i believe there has been renovations done to modernize, but it is still old. The hotel has no elevator and is only 2 stories high. WIFI was good for the most part. Staff is friendly. My first night there while sitting in the easy chair, i felt things crawling on me. I looked on my leg and there were tiny ants on it. I killed them. Few minutes later more ants crawling on my arm, so i killed them, and quit sitting in the easy chair. Next morning i told the front desk about this, and while i was away they fumigated my room. That evening was much better. I suspect the ants came from the little strip of trees outside my window. The room itself was a HPKing. There is no closet in the room, instead you use an armoire to house clothes. Good size flat screen tv, with lousy channel selections. Some stations looked like there was a snowstorm on the picture, while others were normal. The bed was comfy, and the refrigerator does not make noises. There is a clock radio in the room, which picks up static on AM and FM. Breakfast is scrambled eggs, sausage and a McDonald's hash brown. No bananas to choose from. Coffee is available and hot. If you are doing business in Frederick or WV Areas your close to interstates. Not sure about staying here again. As BW Travel Rewards Member, i think one can do better. "not your first choice, not secure, anyone can enter from the parking lot." Stayed here for two nights with two other women, ready for wooly fun at the Maryland Sheep and Wool Festival. the side door lock is broken, so there is no secure entry, anybody can enter from the parking lot. It is right on off the highway, so security is an issue. the shower/toilet area is TINY but was very clean. breakfast area? non-stop infomercials blaring on the TV, do you really want to buy a $250 wet mop? Our first morning there had a tray of uncooked bacon as a breakfast offering, warmed up, but not brown at all, just limp and greasy and white. I will mention that the desk staff was helpful and well informed, gave us some great ideas for dinner, but seemed helpless about the raw bacon and broken door locks. I like to book Best Westerns where possible, as they tend to be a dependably good choice. No difference here, the price was very fair, clean and comfortable, professional staff. Very easy to access off the highway, plenty of parking even if you have RV or trailer. Recommend this one if you are in Frederick MD. If a good night's sleep is your primary objective, you shouldn't stay here. We had a king suite, and that bed was so hard, I had to get up after a few hours of trying to get comfortable. I propped myself in a half sitting position on the sofa and finished the night there. Upon checkout, we mentioned the hardness of the bed, and the clerk stated it was because they are "new" but did not apologize. The bathroom was so small a larger person would not find it comfortable getting in and out of the shower. The wifi was fine and the breakfast was average. Polite desk staff.Side door lock broken(?safety).I asked supervisor who said part is ordered.FREE Breakfast plentiful Hot&Cold foods.nice clean spacious room,with Frig &Microwace. Comfy bed.SMALL bathroom;NICE SHOWERHEAD.HOUSKEEPER NAGGING ME(x3<@0830) in hallway,"Checkout now?". I said by 11:00. "Allegedly Changed the Rules - Visitors May Want to Beware"
MY OPINION. I provided an authorization form for my nephew to stay here with a credit card form that had a clearly indicated cap limit of $1,500. I checked my credit card account after the 2nd day of his stay (@~$100/day) and they had pending charges of ~$7,600 to my card. YIKES!!!! I complained the the credit card company - then they later issued a credit for all but slightly over $200 (which was the correct charge). Although I personally spoke with the hotel management BEFOREHAND to make sure that pets were OK - AND management confirmed that they were - after 2 days they changed the rules and said pets now had to be kenneled - but this was never said to me (or allegedly to my nephew). My nephew had to check into another hotel. Completely AWFUL experience. Well, if you are only looking for an economical stay, this place is yours. Should you desire more, look elsewhere. Hallways look dirty, bathroom is minuscule, mini frig was noisy, breakfast wasn't so great. I will not return. "Great hotel with friendly staff service." The hotel is located in very good location. Few restaurants nearby. Room was clean and breakfast was outstanding. Hotel clerk was very friendly and quick service. Kids stays free in this hotel and they enjoyed it very well. We've stayed here monthly for the past 9 months. The staff is very friendly. The breakfast buffet is very nice & the lady keeps it well supplied with hot food. We would highly recommend this place to everybody. Great service, great staff. Quiet location. The rooms are clean, lots of towels. Free WiFi. I was able to sleep without any heavy noise in the halls. Staff is very polite and helpful. Small but good breakfast buffet. It's a decent place for a quick stop. If you can find it. There is a small sign about 4 by 6 at the driveway that says Best Western. Out on the highway there is a huge sign but no acess from the highway.Ok Its a Hotel and place to sleep. But if you have to initial that you agree to a $500 clean up fine if your room smells like smoke and the whole place smells like a picture a ciggarette Sauna maybe. There is a little plaque on the door of every room reminding you its a smoke free property. Ifelt like I was in that famous picture from China where everyone is smoking. So if you can make a choice and are not a smoker I say stay far away. If cigarettes are your thing eventhough its a smoke free property I guess this one is for you. If they are true to there policy they must clean up no pun intended on the smoking fee. One good thing is the room had a window we could leave open for clean breathable air but that faced they major highway so you had the sound a big rigs all night. We reserved a handicapped accessible room because my husband uses a motorized wheelchair full time. We were in town for 3 nights for a conference, looking forward to the getaway, and, although we had never stayed Best Western before, the website looked nice so we took the chance. Upon check in, hubby could not navigate the room we were assigned - not enough room to get the wheelchair between the wall and the furniture. Once in the room, hardly enough room to turn around in. 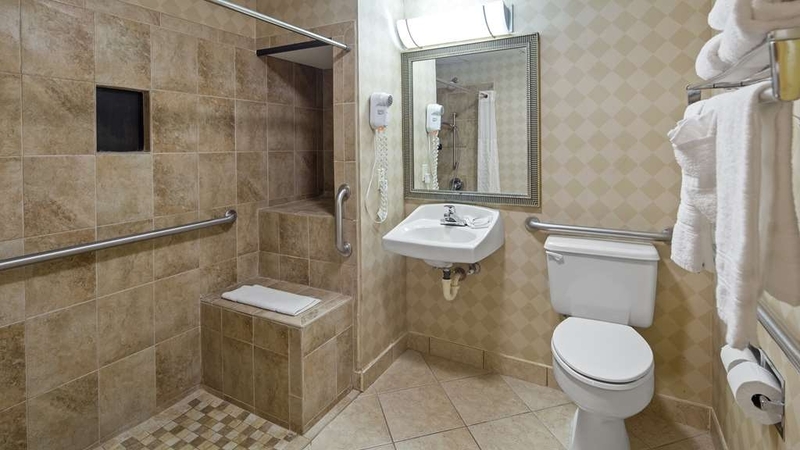 We were offered another handicapped accessible room across the hall. It had a bit more room, so we moved. It didn't take long to find out that the bathroom had a leak. Water all over the tile! That on top of the fact that there was no vanity or countertop in the bathroom - no place at all to put your stuff. Called for repair. Guy came about 2 hours later, kept leaving to "get things" and not showing back up (it was 4/20 - there was a distinct odor of pot on him). He finally came back and "fixed it" around 11 pm. Got up to use bathroom in the night to be greeted by a wet floor again. This was fixed the next day while we were out. Towel bar in bathroom made of plastic. Not enough outlets. Stale smoke smell in hallway. Loud workers in hallway by 7:00 am. Staff was made aware and said, "So Sorry!" Never again! The hotel is very nice and is clean. The workers are also nice. Rooms are cleans and bathrooms were clean. Had a microwave and mini fridge and a flat screen TV. Overall it was very nice to stay at!!!! We stopped here as a halfway point for the night. The price was fair and the room was clean. All the typical amenities you would expect were in place. There was a full buffet setup for breakfast with quite the selection. We would stay here again. Clean and comfortable except the bathroom is tight quarters,the sink is in the room and it's hard to get into the bathroom because of the location of the toilet. Toilet and tub aren't even a foot apart. Free breakfast in the morning is decent. Nothing fancy but good to get you going. All employees I've ever encountered here are always friendly.Doesn't matter what time of day or night I've gotten there they are always smiling and nice and helpful. "Best Western Best in the East"
This hotel had absolutely everything you would find in a 5 star hotel plus a great, complete breakfast with waffles and warm eggs. It was clean and the air quality was nice and fresh. The bed was extra comfortable, as was the easy chair with ottoman. The location was great -- just a hop, skip, and a jump away from anything you might need to get to in Frederick. Excellent check in with friendly helpful staff, great breakfast with hot items and very satisfied with the room. Great mattress and pillows. Plenty of parking, dog friendly with a huge grassy area to walk your pets. Bad food. Bad check in. Bad check out. Running toilet. And no one from the cleaning staff speaks English well enough to accommodate a request. I was not provided the type of room I requested. I paid in cash but they still said I had to give a credit card for amenities. There are no amenities. I was suppose to get an email receipt which 24 hours later I still haven't received. Bad. Bad. Bad. "Noisy and was severly overcharged for room"
Place was clean and friendly with a hot breakfast. No elevator if you cannot handle stairs. Air conditioner was quite noisy. There was easy access to the highway and downtown where there were plenty of restaurants to choose. There were a couple of restaurants very close to the motel. The room was very clean, comfortable, and convenient to locations. I was expecting a larger room based on other hotels that I stay at, especially for an extended stay, but I should have researched before hand. "Emergency Stay At Old Home Town"
Being from Frederick kinda picky where we stay when coming home..Never stayed here but will again.Staff very kind and considerate with our visit.Rooms were clean and quiet enough,just off highway.Thank You Morgan & Destiny. Our room was so dusty and not cleaned well. The hallways smelled of air freshener that was so strong. We could hear every little thing outside of our room, which was right next to a highway. We thought a window was opened, but checked it was just the cheap windows. I called before and was told that they wouldn't charge the credit card used during check in and we could use a different card at checkout. My friend checked in because she got there before me. At checkout we were told her card was already charged and they couldn't switch it to my card. After some push back the finally agreed that they could at least change my card for one of the two nights. I was very frustrated by this. Our family traveled from SC to Maryland to visit family. After a lengthy online search we settled on Best Western and are so glad we did. All the staff we encountered were extremely friendly and helpful. Breakfast was always fresh and plentiful. Rooms were clean, bathroom was small but clean. Would definitely plan to stay here again. this Best Western motel is a great value for the money. it is very convenient to downtown Frederick and is within walking distance to nearby shopping such as Weis grocery and restaurants including Ledo Pizza. it is also close to interstate 270. "Front desk was very friendly and informative"
Very clean and quiet. Front desk pleasant and helpful. Easy access to freeway, you must have a car if staying here as only a very few places within walking distance. I had a very pleasant two night stay. Cheap hotel = disgusting carpet, peeling tub, uncomfortable bed, sickening heavy scent of air freshener. We just wanted a quick overnite so we could hike in the area and weren't up for spending a lot of money because we wouldn't be in the room much. We usually stay in very nice hotels but it wasn't worth it for this trip. Anyway, you do get what you pay for...although it was a little worse than we had imagined. Don't trust the photos online. We couldn't get out of there fast enough the next morning. Breakfast was okay. We got a "suite" which is the same size room as any other regular room, it just has a couch rather than a second bed. We did have a laugh at that. Not a big deal but funny. We stayed here between two days of a conference at a nearby military facility. Our room was clean and well decorated, a change from many chain hotels. The only room issue was the lack of moving around space.within the room. t was very difficult to maneuver about. The worst part was the bathroom. There was barely enough space to open The door fully without hitting the tub. The entire bathroom was 4 x 6 at he most including the tub and toilet footprints. The sink was not even in the bathroom, but in the room. The breakfast offerings were the typical uninspiring chain hotel offerings- cardboard scrambled eggs, dry cereal, sausage and biscuits, tiny yogurt containers. Overall, an ok place for 1 or 2 night, better than many I have seen. Overall, the facility was central and room was clean and well equipped. Staff were friendly and Internet functioned well. The bathroom had been upgraded but was very small. The mattress needs replacing. 1st, I would like to say I'm a Diamond Best Western rewards member. Upon my arrival, I was not treated as such. I stayed at this location using my reward points. There was no exclusive reservations line, no room upgrade, and no recognition gift upon my arrival. I felt that I was profiled, therefore I was placed on the 1st floor in room 119, next to several African Americans who were having a wedding. The room was dusty, stuffy, dingy. The bathroom smelled like urine and the shower curtain smelled sour. All during the night their were people talking loud and hanging out in the hallway, loud banging on doors, and footsteps pacing back and forth above on the second floor. I called several time to the front desk because of the noise, but nothing was done to resolve the issues. This hotel really needs security. Due to the noise, I checked out 3 hour early. On my way to check out of the hotel, I notice that the buffet line was crowded and seem unorganized. "Convenient Location. Great Rates. Free Breakfast/Parking/Wifi." Convenient Location, easy highway access. Great Rates, booked through Orbitz and got a great deal. Free Breakfast, while we didn't use it, the place was packed. Free Parking, but tough to come by on the weekends and in the evening after dinner. Free Wifi, great speeds. The ONLY compliant was the noise, as we were in room #105 which is right by the housekeepers station. It was incredibly noisy around 4:30am continuing through 7am. This was staff noise. The hotel it's self is ok. It's a bit dated. My room seemed very musty/ stale like no one has been it for some time. In my time in this room, I was unable to get the smell out even running the fan/AC. Spray only masked the smell for a short time. It was a real turn off to find no elevator. The breakfast in the morning was adequate. I really think that if this hotel would get a update it would get much better ratings. But I would come back. Slept great. Hello, Thank you for taking the time to review our property. We really appreciate your feedback and will do our best to improve upon the deficiencies that you have brought up. We look forward to your next visit. Thank you. "So close to Historic Frederick"
Every year a big group of students who graduated from Frankfurt American High School or Jr. High in Frankfurt Germany attends the Octoberfest in Frederick and we have been staying here under a block of rooms. It's always a perfect choice because it's so close to the fairgrounds and also Historic Frederick. The staff at clean, attentive and always there working and making things great for the guests. Hello, Thank you for choosing to stay at our hotel when you are in the Frederick area. We are happy to serve your needs and please let us know if we can do anything to make your stay even better in the future. Thank you and we look forward to your next visit. As an avid tripadvisor writer I was a little apprehensive on staying at this hotel based on previous reviews. But I am so thankful we did. The entire reason we choose this hotel was the one particular room they had available. A 2 bedroom room. I had found rates on-line and upon arrival the front desk staff were extremely pleasant and helpful. They allowed for me to view the room before booking to ensure it would suit our specific needs and it did. The only drawback is - there is no elevator - but this is only a 2 story hotel. Thankfully my mother with ALZ was able to climb the steps and we choose to stay. The room was very clean with the exception of a small amount of dark color soap residue in the bathtub - just on one side only - which I cleaned personally (I always carry lysol and lysol wipes to every location we travel - I tend to go overboard on the germ status). This is the only reason I didn't give a full Excellent on the overall review. The rooms were perfect for us. One room had 2 queens, the other had 1 king, the living/sitting area with mini refrigerator, microwave and coffee maker was great. There was a total of 3 tv's in this particular room, one in each bedroom and one in the living area. I walked the entire property out of curiosity because of the prior reviews, I just had to see what other customers complained about, I honestly couldn't find anything. The grounds were clean, there was one hall that was specifically the smoking hall and it was far away from the entrance on the bottom floor. I did not smell smoke in any other areas of this hotel. There is 24 hour coffee available. The breakfast bar was great! Fresh hot food items, a variety of the standard Continental breakfast items. I was most impressed was with the breakfast attendant, she did a fantastic job of keeping items replenished and the area clean. While there is no tip jar available - we still choose to give her a tip for her great service and kindness. We didn't enjoy the pool while there, but I did take the time to walk to it and sit beside the pool, it also was very clean. This location is near a small shopping center and interstate. Overall this was a great experience for us and if we ever get back to the Frederick/Baltimore area we will definitely stay at this hotel again. I would recommend this location to anyone choosing to stay in Frederick MD. Hello sir, We are honored to have served you and we appreciate your praise for our property. If there is anything we can do to improve our service and the experience of our future guests, please let us know. Thank you and we look forward to your next stay with us. This hotel was not in the safest of neighborhoods. There was a grocery store within walking distance, however I would not walk to the grocery store alone or during the night. The breakfast was free and standard to what you find at continental breakfasts. The room was so so. Bed was comfy but the pillows were not. I would only stay here again if I absolutely had to. If towing or driving a uhaul get to the hotel early because parking is limited. Hello sir, Thank you for taking the time to review our property. We appreciate your business. If there is anything we can do to improve our service or make future guests stay better, please let us know. Thank you and we look forward to your next visit with us. "smoking allowed in nonsmoking hallway and rooms"
The room was so bad I had to sleep with the sheet over my nose. I would have left if I was not traveling and been too tired to go elsewhere or asked to be moved. Both my husband and I left with headaches. I used a travel card so I was unable to dispute the charges with my credit card or have them take it off. lessons learned. The manager stated he would contact corporate to reimburse for a free night to make up for it they gave me 3700 points. I used 22,000 for the travel card. Does not add up. Based on previous reviews this is not a recent problem. Traveling back from vacation we DID NOT even consider stopping at this hotel. First room had a plumbing issue, so I was assigned another room quickly. I put my bags down, got a meal, and came back to find the room keys didn't work. The employee behind the desk came to open the room, upon which I saw that a half-clothed stranger was in my room! He resisted letting me come in to get my belongings... something very sketchy was going on in there. Turns out, the front desk accidentally gave my room to someone else and deactivated my room key! I was offered a room upgrade but chose to leave. This place is NOT clean or secure. In addition to the room issues, there was a lot of drinking and loud behavior in the parking lot and hallways. STAY FAR AWAY. Everything anyone needs for overnight or extended stay. The hotel has a very quite location with easy access. Lots of local restaurants and shops/stores immediately available in area. The rooms were very nice... with exception of stained carpet in main room and mold looking residue around perimeter of non-slip treatment in shower floor. The breakfast area was very clean and orderly though a little cramped. The receptionist/clerk on Sunday morning appeared as if she just rolled out of bed and stepped behind the counter. My boyfriend and I stayed at the Best Western in Frederick, Maryland just to get away from work and relax. Frederick is a charming town and had a lot to offer. We visited museums, walked around the center of town to shop, ate at The Wine Kitchen, went to a baseball game for the Frederick Keys, and even enjoyed a night out at the movies. Best Western offered us a wonderful location to be in the center of everything. We stayed two nights as tourists from the UK. It offered great value. Reception was pleasant and helpful. The room was clean and well appointed. The breakfast was not quite what we get in the UK, but was more than adequate. The internet worked well. There was a clean, inviting swimming pool. What more do you want? Clean and Secure place to stay with helpful and friendly stuff, in quiet setting. The house stuffs are very courteous but friendly and efficient, and it is a pleasure to have a breakfast there with good coffee. Parking was good, hotel was clean, employees where friendly and helpful. The hotel does not have an elevator so I asked to be moved to a room and the first floor. The bathrooms are very tiny. Just enough room for the tub with the toilet right along side. Barely room to close the door, but it was clean. It was perfect for our one night stay but I wouldn't want to stay more than that due to the bathroom size. Wifi was fast, which is hard to find in some hotels. The breakfast was your average hotel breakfast, scrambled eggs (watery) bagels, yogurt, waffles, cereal, etc. We only needed a one night stay. For the price, it was good. The staff was very nice. Our nonsmoking room had a nasty odor though and no extra sheets/ bedding were provided for the sleeper sofa ( I didn't bother to ask though since I just used the flat from the bed). Breakfast was good. Bathroom was tiny and in a bit is disrepair. Again, decent for the price but glad it was only one night. Walked across the carpet barefoot one time after taking off my shoes and left black foot prints in the shower. It is the only place I went shoeless all day. The room smelled musty and of mildew the whole time I stayed there. They charge you $2.00 for ECOSTAY per day and don't let you know they are doing this. Not sure how eco minded they are. The sheets smell like bleach. I have stayed here previously, almost a year ago. I was really disappointed in how far down it had slid. The staff is friendly and helpful. The business center can be used to print things but be sure to delete your cookies etc when you are done. Who know who uses it after you. "Ok....for a one night stay"
the room smelled like mold and the bathroom was VERY small with the sink outside of the bathroom. The shower was small too. It is an okay place but definitely not to stay for more than a day or two tops! I stayed here because I could not find a hotel when I flew into Baltimore. Good place to stay, we had a Handicap room, but everything was clean and quiet. Also a good place to stay and check out the town, one of the nicest historical towns I have see. When traveling to Frederick I had the privilege of staying at the Prospect St. Best Western. The hotel is clean, smells fresh, is convenient to local highways, staff are helpful and well mannered. All in all a great stay. Breakfast was good too! Very clean. Seemed updated - all but the TV. It appeared unable to do HD. Could've been the cable service. We didn't complain, as we didn't spend a lot of time in our room. The gentleman at the front desk - sorry I didn't get his name - was VERY pleasant! Breakfast seemed kinda weak. I guess I can resign myself to 'prefab' eggs but, if they look scrambled, they seem more palatable. The egg circles are terribly unappealing. Another nit to pick - the shampoo and conditioner were the worst. Most folks would say - what do you expect for free? But, they're not free - they're included in the price! "Good - but some drawbacks"
The room was comfortable and clean, but with then walls. Perhaps if there is not a door separating the two rooms of a possible suite, the noise would be less. I could follow the Olympics being watched in the room next door, throughout the night. The chief problem was breakfast.I think it would have been OK, if you could get to it. But the breakfast area is far too crowded for the number of guests. Bedlam. "Best Western Frederick a hidden winner for travel"
This hotel was great. The rooms were clean, the bed was comfortable. Easy access to the amazing historic downtown Frederick district. Breakfast buffet was so nice to have available. The staff was easy to work with. "Very short stay, but comfortable"
My husbands and I had another enjoyable stay at the Best Western Hotel in Historic Frederick, Maryland. Our last night was spent in a mini suite, which was very nice. Their were a number of people enjoying the outdoor pool. It is conveniently located just off route 15. There is no elevator to the two story building, but the desk clerk it offer to carry our bags up if needed. The rooms was very clean and quiet- despite the fact that every room was booked. It met our traveling needs. I would stay there again if the rate is competitive. "Enjoyed our stay in Frederick"
We frequently stay in Frederick on our way to the east coast but have never stayed in this Best Western. The hotel is a short drive to the historic area and to the freeway. Front desk staff was very friendly and welcoming and gave us information about local events. Our room was clean, quiet, and comfortable. The housekeeping staff was very friendly and helpful. Breakfast buffet had a lot of variety and was well managed. My boyfriend and I stayed one night at this Best Western on our way to Washington D.C. We had been driving since dawn, and had reserved a room on the road. We arrived late, at around ten o'clock, but the staff was very courteous and sweet. The room itself smelled a little funky but it wasn't anything overpowering. There was a microwave and fridge and the price was really reasonable. We missed breakfast because we slept in, but the bed was pretty comfortable, and the walls were insulated enough that we couldn't hear our neighbors. The view was nothing to write home about, but as a pit stop on our way to see D.C, everything was perfect. Chose this hotel because it had fairly good ratings and reviews. We also were able to book this hotel for a good price in comparison to the other hotels in the area. Upon arrival, the front desk/lobby area smelled of cigarette smoke. Not a big deal, but was not the best 1st impression. We were given a room on the second floor, and informed that there was no elevator. This was not a problem for us. When I opened the door to the room, the room connecting the adjoining room was open, and there were drinks sitting on the tables in both rooms. We traveled back down to the front desk and they quickly got us another room. Cons: Although the room was clean, there were some areas that could have used a little extra attention. The bathroom was EXTREMELY small. There were parts of the hotel that looked like it could use some attention. Pros: There is a pool. It is in an excellent location. Breakfast looked good. The staff was very kind and helpful.The price was right. If you are looking for a place to stay overnight for a decent price, I would recommend it. "Very nice stop along the way"
Spent one night in Frederick along the way to Harper's Ferry and on South. Had read the previous reviews and decided to try (many Best Westerns have lost the word "Best" from our experience). Glad we did. The hotel was clean and fresh, our room was just about perfect. Staff were excellent (especially the lady running the breakfast which is a thankless job in a smaller than needed setting). All about it, especially the price we got through Best Westerns membership, was fine. This one will maybe make us look at this chain more closely in other locals. Thank you for presenting a really nice experience. Great service with super nice people checking us in!! We were given the choice of 1st or 2nd floor (we prefer 1st). Room was nice size for three people. Like that the sink is outside the bathroom. Even tho the toilet and shower are kinda packed in a small space it wasn't too cramped when using them. Fridge and microwave. Tiny shampoo and conditioner and soap waiting for you in the shower. Hair dryer, iron, ironing board, flat screen TV and free Wi-Fi. Great breakfast in the morning until 10:30am!!! And a pool also! AND GREAT PRICE!! Definitely recommend for anyone!!! "Great Stay. Great Value. Great Staff." We spent the past weekend in Frederick as part of a family reunion. The hotel was clean and the beds very comfortable. In addition, the staff was very accommodating to our group. I would stay here again. "One night stay on the way back to Chicago "
We had stopped at Country Inn and tried to book there, but they were full, so the front desk called here for our family of 6 to stay for the night on our way back to Chicago. The gentleman on 3rd shift at the front desk was very polite and helpful. The lobby and the second floor hallway smelled VERY strongly of marijuana though! It would have been a deal breaker any other night, but the rest of the area was booked for the weekend. There is not an elevator FYI. The rooms were modern for the most part, which we really appreciated. The beds were comfortable, but there was dust/drywall-looking material around the edges of the room. Also, there was a long hair on the inside of the shower curtain, and there seemed to be mold growing on the back end of the shower floor. The walls on the shower didn't appear to be clean either, as there was residue on the shower walls. I did like the larger refrigerator in the room! When we checked out the next morning, the gentleman at the front desk was very polite, friendly, and helpful. Excellent staff, just could have been cleaner. This was a great hotel with a reasonable rate for a 2 night stay while visiting family. The bathroom was a little small. The room with the tub and toilet was very small. You had to step in and then move behind the door to close it but not a big deal. Just a little cramped. The pool was great. The hotel is very pleasant. The staff are super nice. Samantha at the front desk was very polite and helpful with restaurant ideas and seeing the sites. Rooms were very clean. Breakfast was plentiful. Would definitely come again. "Great Value for Money at BW Historic Frederick"
This hotel was very easy to find. It is a short drive, or a comfortable walk (1 to 1.5 miles) to the downtown area of Frederick, which is very cute. It is conveniently located to many historical sites (Harper's Ferry - the one we visited this time). It is not "ultra fancy" but for the price, the cleanliness, the extremely comfortable bed, and the respectability of the breakfast items, I don't see how you could beat it. Awful, my room smelt horrible, no elevator, and there was way too much noise. The front desk people were nice but the entire overall look of the inside of the hotel was dirty. The breakfast was not very good and was cold. this is my second visit to this hotel during the doom fest in nearby 611 cafe. hotel is close to venue. room was clean check in was flawless. breakfast was fulfilling . room was clean bathroom was spotless mini fridge and microwave were a nice bonus. ac unit was a lil bit loud. hotel is located next to a shopping center and several fast food places. overall good second stay at this property..
"poor service, halls smelled, bad breakfast"
We were only at the hotel for one night, but what an impression! Beautiful decor, great breakfast, very clean. We needed to get suggestions for a place to eat dinner. The desk clerk not only gave us some, but also printed out direrctions for each! We loved the hotel so much that we wanted to return for a longer stay! 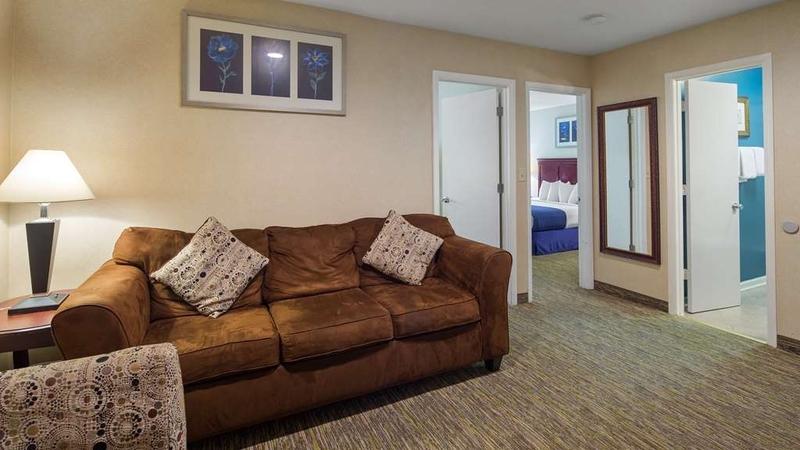 Large clean room,double queen,$108 for night,absolutly nothing wrong with this place,but if elderly or infirm request ground floor[no lift].Quiet area just off freeway but far enough away,was very busy that night. clean, quiet rooms. helpful staff. nice breakfast. close to downtown shopping, dining. two story hotel has no elevator, so keep this in mind if you have trouble with stairs. bathroom very small. close to Hood College. "Stale cigarette meets locals take over the pool"
Unfortunately, these relatively clean and purposeful rooms are overtaken by the stink of stale cigarettes. When rooms are converted from smoking to non-smoking, EVERYTHING MUST GO or the smell lingers. We were disappointed to discover we could not walk into town and had to drive everywhere. Furthermore, we chose this pool for an outdoor pool so our kids could swim. Unfortunately, our pool time was dampened by the arrival of local "riff raff" taking over the pool. There is no security in that pool area to guarantee only those people staying at the hotel are using the pool. These "riff raff"were drinking alcohol, very loud and obnoxious, and almost jumped on my daughter's head at least 5 separate times when they jumped in the pool without regard to anyone else. Many customers came in and immediately walked right back out. It was so disappointing. The price is attractive and the rooms are clean but considering the smell and the pool situation, I doubt we will stay here again. Plus, I had to book my two nights online because the actual hotel could not honor certain Best Western specials....weird. Not really a big deal except when we arrived we wanted both nights on one card and billed at one shot....this was not done. We only realized this when we perused our card information - frustrating that these people cannot process everything themselves or coordinate 2 back to back reservations for the same person correctly. "High price for reasonable quality"
Nothing was particularly wrong, but nothing was particularly right. I have NO PROBLEM staying in budget hotels, but felt this hotel was simply overpriced for the quality of the room and the mediocre location. Like I said, nothing was wrong & the room served its purpose, but I was disappointed nonetheless. I don't mean to discourage anyone from booking here, but want to make sure anyone who does knows exactly what to expect: a budget-quality hotel. Tiny Bathroom, beds are small and could hear the springs in it as I moved. Hall smelled like cig smoke. Employees arguing with each other in foreign language. Eggs and bacon were cold. Overall bad impression of Best Western. I'll stick with Hampton Inn. "High Quality for Reasonable Price"
Very high quality for a very low price with a friendly staff and perfect location. 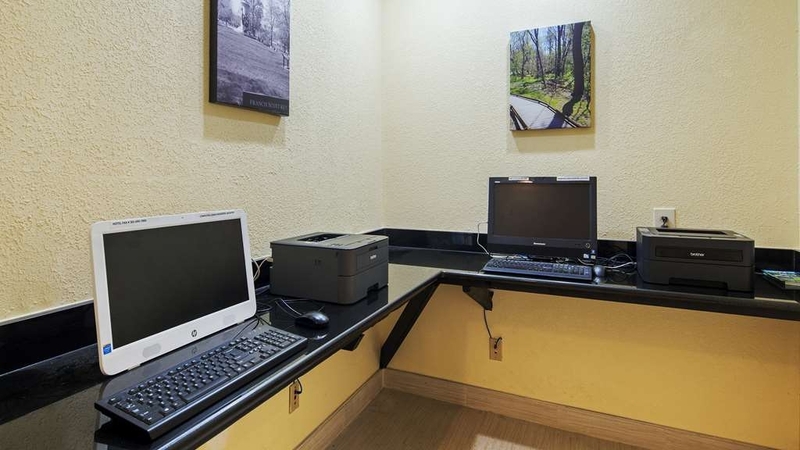 It's hard to beat this centrally located hotel with such a clean, comfortable room and excellent internet service for such a reasonable price. You can drive out of the parking lot and go up to a light that will allow you to drive right onto either Rt 15 or Rt 270 or Rt 70. Lastly, it was very VERY quiet at night. We slept in both days as we are retired and stay up late. We stay here every time we come to visit our son and grand children. Made reservations on 4/1/16 through Booking.com and even called later in the day directly to the motel and confirmed my rooms. When arrived on Friday for a 2-day stay, they did not have the rooms I reserved. They blamed Booking.com. When asked for a discount since the reservation was incorrect, we were told if we did not want the rooms, they would rather give the room to someone who will pay full price; although, we were given a small discount for the incorrect room and was fully made aware of smoking policy in the motel (fine would have to pay). Also, the air conditioner did not work in the one of the rooms. Not everyone was inconsiderate, but I have never ever been treated like that. Also, TV channels are very limited. Make sure you have something else to do. Glad we did. Unfortuately, lots of children there and I guess some parents do not have consideration for other people. Second time staying at a Best Western, and both times have been terrible. Never stay at a Best Western again. "Great accommodations and very good staff." 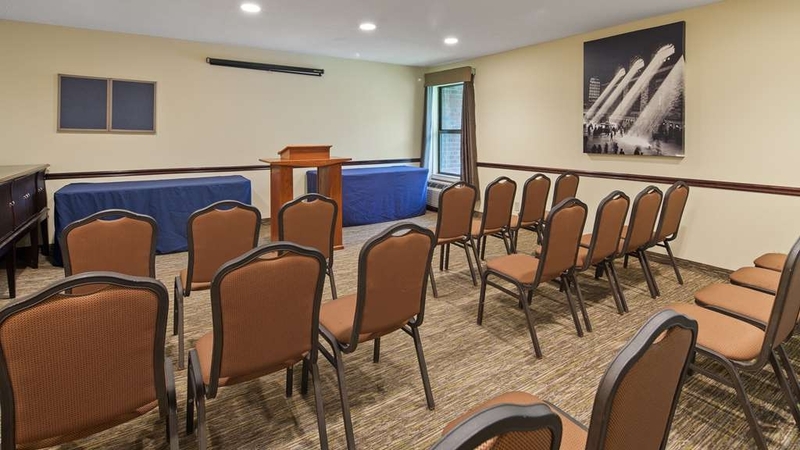 We had a large group of Military Veterans and we chose Best Western because they were highly recommended to us for our trip to Washington DC. So if you are a Veteran give these people a chance to show you their hospitality. Rooms were very comfortable, and excellent breakfast choices before you start your day. We will definitely stay at this Best Western again. This hotel was very comfortable with a great location near the interstate highways. The free breakfast was a bonus with very good food selections. The fitness center was clean and had a good variety of equipment all in good working condition. They have a very good map of the local area and the front desk people were very helpful with directions and suggestions. "Good value but ask for a quiet room"
Nice clean property with comfortable well appointed rooms. Very nice, friendly, and helpful staff. Good comfortable bed and decent internet connection. The BW is the only commercial hotel within a reasonable walk to downtown (about 2 miles) which is why we chose it. Our only complaint is that a trash truck outside our room woke us at 5:30am, and a lawn mower woke us again at 6:30am. Next time we'll ask for a quiet room or one on the parking lot side of the hotel. For the price you don't expect much but I have experienced better for that rate. I booked a non-smoking double and in that section of the hallway you can still smell smoke. In the room it smells musty and damp so you need to keep the a/c on or window open to keep the air moving. The most inconvenient part for a tall person would have to be the tiny bathroom. It holds the toilet and shower/tub and it is not even an arm-span width wide. It's wasn't a particularly couple of quiet nights between noise from the lot outside the window, the noisy motor of the fridge, and a stream of loud lobby and hallway confrontations. I opened the door at one point to some guests leaning on the wall, asking me if I knew where the hotel bar was. They don't have one. You do find a mixed (hungover looking) crowd at breakfast in the morning. That is probably this Best Western's high point, continental breakfast. Self made Belgian waffles, a decent spread of bread products and hot items come out frequently. "An inexpensive night, nothing to write home about"
If you just need a place to sleep for a night and don't want to spend much, this hotel is fine. The lobby is not inspiring, welcoming, nor comfortable. Its a place to get through the check-in process so you can escape to your room and close the door. The rooms are fine, the bed comfortable, the amenities typical, the place generally quiet. Within walking distance are a few decent, reasonably priced restaurants (Greek, and Thai), as well as a grocery store, liquor store, dollar store etc. Access to "historic" Frederick requires a short drive into the main part of the city. This hotel is right off the highway interchange, so its a quick in-and-out. I'm sorry to say that this place have probably seen better days. OK, for a nights stay but I wouldn't want to stay much more. Not really that clean and tidy. The breakfast was suprisingly ok though including bacon and scrambled egg. The pool wasn't open. Check in was courteous and quick and explained all amenities and easiest way to get to our room and where to park to get their quickly. Breakfast was worth it and was easy to access. Check out was quick and easy and got us on the road. "Price was right. Place was very good." We chose the hotel based on TripAdvisor reviews and found them accurate. "Good value. Easy Access." And the windows open! That is a real plus. We were on the first floor on the back side. The view was of the rear of the shopping center, but that cut down on nearby traffic noise from the interstate. Plenty of info from the front desk. Quick trip into Frederick's interesting downtown. We only had one evening and half the next day to explore. Check-in and Check-out were very easy. The front desk staff was friendly and eager to make sure all was well with the reservation. The room was very clean. The beds and pillows were quite comfortable. Internet connection was quick and strong. The breakfast was excellent, with bacon, eggs, waffles, bagels, bread or toast, danishes, coffee and more. We did find the bathroom was a little small but this was a minor problem. The rate was more than competitive with the competition. The hotel staff were helpful and friendly. The hotel is clean and newly refurbished. Its location is right next to a petrol station, supermarket, pharmacy, restaurants and news agent - very convenient for those last-minute needs and late-hour cravings. As always a great place to stay. Nice rooms. Comfy bed. Lots of pillows. Nice hot powerful shower. The best part of why we stay here is the truck parking. We stay a couple times a month and we will be back. needed a room after traveling all day, I had stayed here before and it was a great time, so I came back. it was welcoming I noticed the renovations and it didn't bother me. Everything looked nice and the staff was wonderful. This hotel is serviceable. It is close to downtown and shopping. It does not have an elevator so you have to carry bags long distances and up stairs. it was currently under renovations so it was noisy and dirty. Above Average hotel, staff, parking lot could be better, location tucked away in a neighborhood, but that didn't hinder service and quality of hotel staff and stay; Breakfast was not bad, had different some variety for a continental breakfast. Had an issue with the room, notified staff, tried to fix it but could not so offered another room. Staff was excellent. Called after we checked in to see if all was ok. Gave excellent directions for dinner. Hotel was clean. They were undergoing renovations, so it was a bit in disarray. Breakfast was great and staff very cordial. Nice stay. My reservation was made on Best Western site. We got a great price. Motel was easy to find. Check-in was fast with no issues and the room was clean and quiet. The parking lot was well laid out and had room for truck parking. ( I was driving a 16' foot rented moving truck.) I wish all motels were this nice. I brought my mother along on a business trip in Fredrick and found out that not all Best Westerns are the same. Two weeks ago I stayed at the Best Western in Hagerstown, MD that Best Western had Turner Classic movies on the television, which made my mother happy! "Under renovations but excellent service!" We arrived very late and Mr.Mamadou was very gracious and made us feel welcome right away. He went out of his way to find out if breakfast will be served the next day because of the renovations. Not only was served, it was excellent! The ladies at the breakfast room did a super job with the spread of different foods hot and cold! And making sure all was in a good supply! The room was very nice appointed, the beds had comfortable mattresses and pillows. All was in working condition. Upon check out Mr. Khetia was extremely professional and many times apologized for the inconvenience of the renovations, which really did not bother us. We checked in late at night, and literally left the first thing next morning, so didn't get to use much of the facilities. A cheap alternative to staying in DC, only an hour drive away. The location is great, right off the highway and easy to find. Check in was smooth, and the staff were helpful enough.The room was spacious, had everything we need, even had things that we didn't need (microwave, fridge, ice bucket...). I liked how the washing basin was located out of the bathroom so with four people sharing the room it was more efficient. The shower was plenty of hot water, and the many pockets around the tub made it very convenient. Wifi was excellent in the room. Only downside was the dining room was under renovation overnight, so when we wanted to leave early the next day, the breakfast wasn't quite ready and everything was a bit dusty. Otherwise the breakfast was standard with a bit of choice. Hello Debbie T, Thank you for choosing to stay with us. At Best Western Frederick, we place the satisfaction of the customer above all else. The hotel is currently under renovation. Please pardon our progress. Once the renovations are complete, I invite you to stay with us if you are in the area. You are always welcome. We want to show you what it is like staying with us when we are at our best. If you need to contact me, you can call 301-695-6200. Please let us know if you need anything. Thank you. we were unable to use the desktop computer because of remodeling going on. on the plus side, this motel is in a great location - walking distance to grocery and restaurants. also, close to historical Frederick, Maryland. We stay in Best westerns all the time but this one took the word Best out of it. Renovations the hotel looked run down. At least lower the rate during renovations. No business center because of this .No computer. Small bathroom with a very high hard to get into tub. No outlet near bed to plug my wife's CPAP machine into. Front desk not that helpful. Not worth $82 a night. All Best Westerns are not created equal. This one is best to avoid.Bed was old and not comfortable at all. "Not all Best Westerns are created equal"
We came here because the Best Western in Rockville was booked so we came here to do some sight seeing in Frederick. The hotel on the inside was in disarray I understand that they might be under construction but leaving ladders and a mess in the stairwells looks really unprofessional.My stay was short because I was bitten by bed bugs. The staff at the front desk was accommodating. The room I stayed in looked nice but it wasn't until the lights were off that I realized there was a problem. 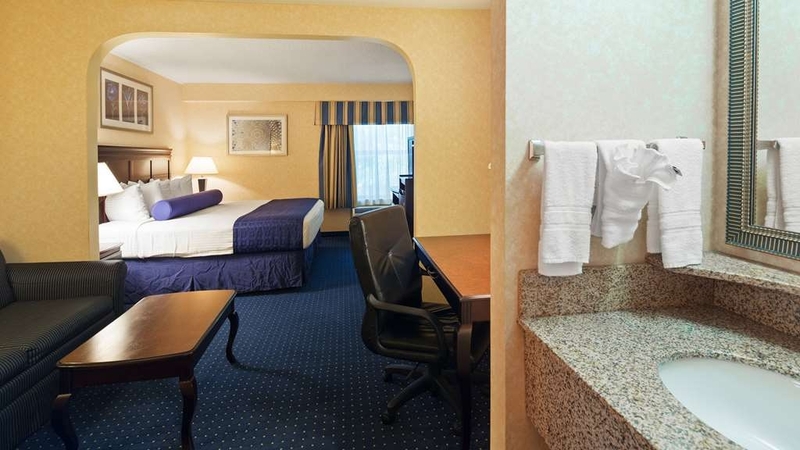 I got bit in our first room and the front office staff switched us to another room ( because it was really late after 11pm) which was good but then I got bit again in the second room.I immediately made another reservation at the Best Western in Rockville, MD. I really did not like that the beds did not have bed protectors so both times we were on beds that only had sheets between us and the bed. I don't think we should have been sleeping on bare beds. My boyfriend and I went back to the Best Western Plus in Rockville where we are much more comfortable and where they have bed protectors. This hotel should not be open during this stage of renovation. The lobby, breakfast area, stairwells and other construction zones were a mess with missing doors, walls, dust and construction equipment everywhere. Also, bathrooms were super small with only shower and toilet... sink area and outlets were right next to the beds (outside of the bathroom) so getting ready in the morning I had to wake the entire room with my hairdryer, brushing my teeth, etc. not ideal for our situation. 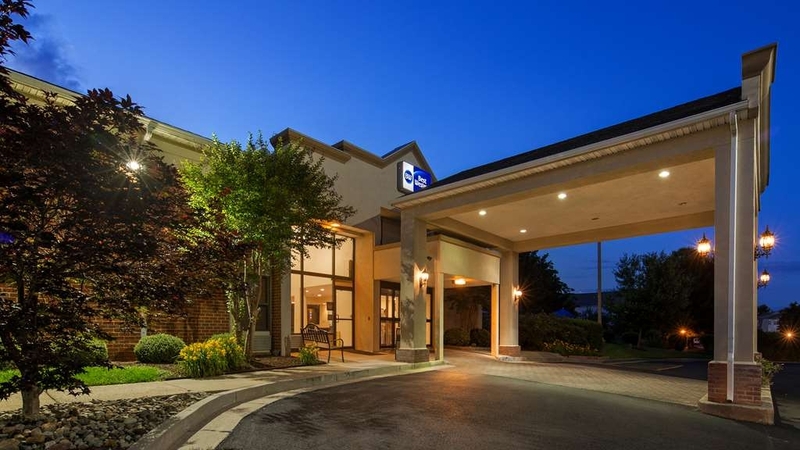 "Enjoyable Stay at BW Frederick"
Excellent Staff, very accommodating. Pricing is very reasonable. Great Breakfast. Don't expect a great decor or atmosphere while they are doing renovation now. But the services rendered by the staff will make the stay enjoyable. "Will try and stay here again"
Lovely room with a very comfortable bed. We had a long drive and the overnight stay was the best we had in a long time in any hotel. Hotel is somewhat hidden down a side street. Noticed it from the highway and found out way to it. 1 step above average. The heating system in the room was inoperable. However, they did move me and upgraded me. The decor in the hall just wasn't acceptable to me . a lot of construction and the hotel on the inside look dreary. The bed was very comfortable, and the manager was very helpful. The room, however, was a bit dirty. We pointed this out to the mgr, and he promised to check it out. He gave us a discount because of the dirty room. We would come here again, as the dirt might be an anomoly. Hello Mark H, Thank you for taking time to write a review about your stay here at the Best Western Historic Frederick. I want to apologize about the condition that the first room you were in and I am glad that the Manager on Duty was able to move you to a different room. We are taking your comments as a training opportunity with our staff. We hope that you will give us another chance the next time you are in Frederick. Traveling from upstate NY to Richmond, VA, my wife and I had gone as far as I was willing to drive that night. We chose here because it was a modestly priced hotel with solid property reviews. The hotel is clean, well-maintained, with an above-average breakfast. But, it was Marc who made the difference. He greeted us with a big, genuine smile. He volunteered all the information we needed to park, find our room, use the WiFi, etc. - we didn't need to ask. Each time I passed the front desk, he addressed me by name. It's clear that this young man was paying attention and working hard to make our stay as pleasant as possible. "Very nice and accommodating staff"
I was very happy with my stay at the Best Western Historic Frederick! When I first arrived, the staff was very friendly and welcoming. My Check in was quick and easy. During my stay, I was always greeted when entering or leaving the lobby area. The dining area for breakfast was clean and the breakfast options were good (what I have come to expect from Best Western). The room was clean and comfortable. The channels available on the TV were varied and had a good selection. 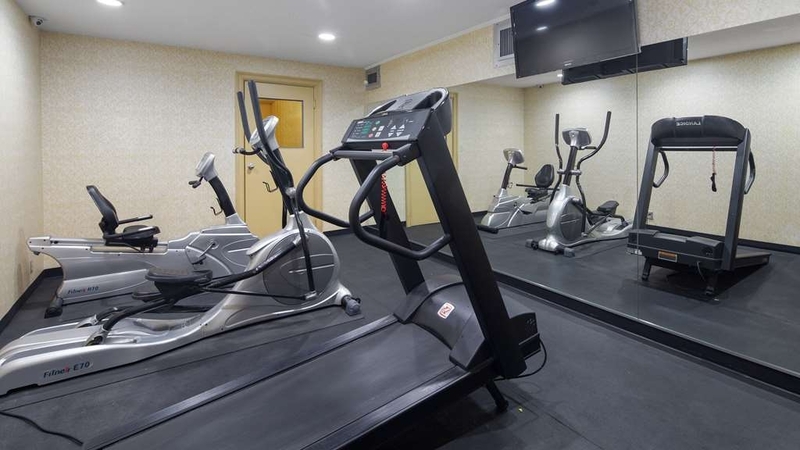 The fitness center was clean, equipped with an eliptical, 2 treadmills, and a recumbent stationary bike. The hotel is located close to the multiple freeways and major interchanges, making travel very easy. It is also very close to downtown Frederick's shopping and dining options. I would definitely stay here again! "Great staff and awesome breakfast!" 23 reviews 5.0 star rating 1/25/16 I stayed here recently and I enjoyed a fantastic breakfast, welcoming staff and clean room. Thank you to Mare in the Sales office and her team for their hospitality! "Nice motel with great breakfast"
This is a nice motel in Frederick. We were there in the winter so do not know how great the pool was. The breakfast was great with an awesome selection including fresh fruit. The motel was generally pretty clean but we did have trouble in our room getting cleaned. We left late in the mornings and took the "do not disturb" sign off before leaving. Evidently they do not keep track of which rooms have been cleaned (like all the other motels we have stayed in) and we would come back in the evening and have to go get towels and trash bags, etc. We also had trouble with the internet. It would show full bars but to internet. "Good value and spacious accommodation "
We stayed here for just one night and booked a two bedroom suite as we had three adults. The suite was spacious and easily accommodates 6 and includes a separate living room / each of the 3 rooms had a TV. The checkin was quick and easy, better than some 4 and 5 star hotels I've stayed in. And the room was clean and tidy, whilst the hotel is older they have tried to maintain and our suite had freshly painted doors and the bathroom sink unit was new. Rate included free Wi-fi which was fast and also breakfast which had cereals, yoghurts, scrambled eggs,sausages, biscuits and gravy. Also a waffle maker to make fresh waffles plus muffins and bagels. Plus juice tea and coffee - so plenty to have a snack before you get on the road. The hotel is convenient to downtown old Frederick - about 5 minute drive. Stayed one night as family member had a business meeting. Stayed in family room good size freshly painted very clean everything you needed fridge microwave. Breakfast okay standard fare but adequate. Would stay again good value. Room was a lot bigger two bedrooms and separate lounge area. This hotel offered a comfortable sleep even though the sheets are a bit threadbare, they were clean and soft. Mattress was comfortable.Pillows are small but comfortable. Some dust accumulation behind furnishings, but the room was clean overall and pleasantly decorated. The bathroom was very small but it served it's purpose. I had a King Standard room and it included wi fi, cable tv, mini fridge, microwave, coffee maker, toiletries, iron and board,a full breakfast and a noon checkout time, this hotel is a great value. It is close to the interstate however we were not disturbed by any road noise with a room on the parking lot side. Simply put, a clean comfortable bed, cable tv, internet surfing, fridge/microwave and get your belly full in the morning with a late checkout its a excellent value. The night check in staff was amicable and efficient. For a quick overnight stay at a more than reasonable cost, this is a excellent value conscious hotel. Hello! Thank you for taking time to write your review. We appreciate your feedback! We strive to offer a great product for those traveling through Frederick, MD. With your feedback we are going through our linens to make sure that there are none that are threadbare on the beds. We look forward to seeing you the next time you are in Frederick, MD! Each hotel chain has their idea of quality. This was our first stay at a Best Western in years. Our suite was tiny. The bathroom was ridiculously small but it worked. Very friendly and helpful staff. This location was not familiar with our Christmas traditions. There was no response from the staff when we greeted everyone Christmas morning with "Merry Christmas." The complimentary breakfast was very good. This location was easy to find and right off multiple interstates. We would stay there again. Traveling from Upstate NY to Richmond VA for Christmas. Good location with easy access to highway. We asked for a room away from the noisy highway and that was fine. Check in and check out was fast. Breakfast was the typical hotel chain hot/cold offerings...adequate. The room had a "perfume fragrance" like trying too many cleaning products. The bathroom was so SMALL I bumped my elbow on the wall when sitting down to use the toilet. (I'm 5'5" and 140 lbs). The bed and linens were OK. Overall for $70 it was what one would expect....just OK.
"pleasant stay at 2-start hotel"
pleasant 2-week stay. Housekeeping and clerks at front desk were always smiling, readily available and helpful. DY from the front desk was friendly and very helpful. Giants and several restaurants are nearby. clean room. loved the sheets at the king-size suite. Great value for 2-star hotel. Weighing in at $75 for a king-size bedroom for a night, the Best Western Frederick was a perfect value for our recent stay in Frederick, MD. The hotel is an older property, but the rooms, lobby and hallways were clean and the staff was more than polite and helpful, from check in to check out. At every opportunity the staff, from front desk clerk to housekeeping, took the time to wish us a good morning or good evening and asked if we needed anything at all. The rooms were clean, and while the bathroom was very small, it was adequate enough for our needs. The breakfast area was large enough to accommodate guests and while the offerings are standard free hotel breakfast fare, they were ample. I would recommend this hotel looking for a value in Frederick. whole lotta meh going on. Just a cheap, ratty hotel with paper thin walls and not much else. Bed full of cat hair. Bathroom where you hold the door closed with one leg while putting the other in the bathtub. It's like Manhattan living all over again. Only thing worse than the beds is the pillows. Buy breakfast and coffee elsewhere. Also, choose a different hotel. "Nice room, poor breakfast, varying service quality"
During checkout, reception staff was not able to put the correct billing address on the invoice, which caused problems with German tax authorities. The breakfast area is definitely a weakness of this hotel: Food variety was poor, and disposable tableware is nowadays not acceptable anymore. However, room quality was definitely okay, and apart from the checkout problems staff was friendly and supportive. Standard hotel room, reasonably priced, microwave and refrigerator. Extremely small bathroom. Would stay here again. For an overnight stop on our trip it was more than adequate. Friendly staff and helpful. The lighting is poor on the road getting there but once you find it it is in a good location. 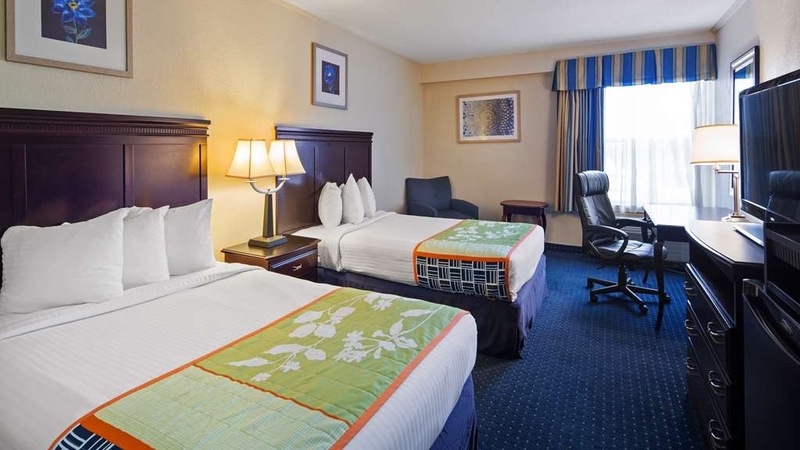 we enjoy this hotel because it is convenient to major highways around Frederick, Maryland. there are restaurants nearby and a grocery within walking distance. it is a good value and the employees are friendly and accommodating. Greetings from Frederick! Thank you, for taking the time to write such a nice review of the BEST WESTERN Historic Frederick. I will share this with the staff so they see that all their hard work pays off, for we strive to accommodate our guests with a great stay while here in Frederick, MD. The rooms were compact but neat and were comfortable. The breakfast was good as well offering several hot items and were well presented. Thought I had a problem with the heater, but it was me...had it selected for the wrong setting; but the service staff were prompt and courteous in explaining how to use the unit. 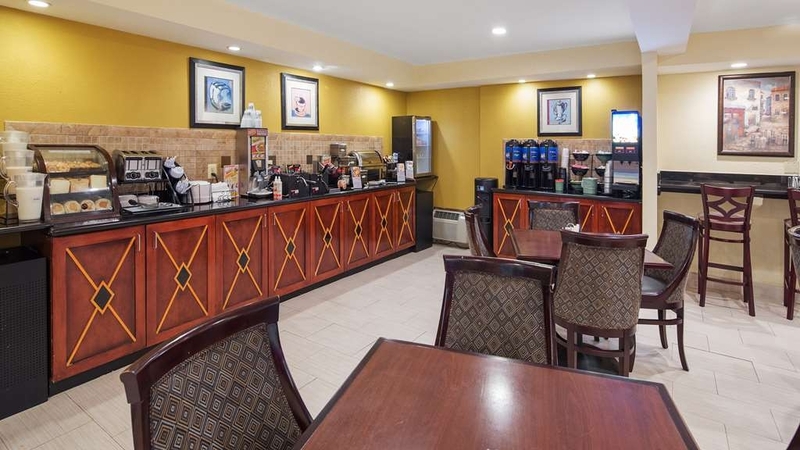 "Great deal for a really nice hotel"
Clean, friendly, nice lobby and breakfast offerings. My dad and his friend stayed at the hotel for his grandson's baptismal weekend. Location was perfect as my son lives in Clover Hill and it was a great value. Wouldn't hesitate to stay there again. The staff was very friendly. The Hotel and room was very clean and well kept, The room was nicely decorated and had a welcoming comfy chair to relax in, which is very nice after a long day on the road. Was a really nice place to stay. Would highly recommend. we like the hotel, but be forwarned that their is no elevator so unless you get a room on the first floor, plan to carry luggage up one flight of stairs to second floor rooms. bathroom was clean, but other rooms were dusty, and floor needed a real serious vaccuuming . Once we found the hotel, it was in a very quiet location close to a grocery store and small mall and almost in a residential area. Check in was easy and the desk clerk was helpful. Our room on the second floor was very clean and and well appointed. Breakfast items were pretty standard for a Best Western. Lobby area and breakfast room were also clean. "A good deal, average hotel, but nice manager"
This seemed to be the closest property we could get to downtown Frederick. I was intrigued by an incredibly low weekday rate, and fairly good ratings from others on Trip Advisor. I asked the manager for a room in a quieter area, as the back of the property is near the freeway, He complied, but gave us a handicapped access room, which we didn't need. In this type of room, there is a free standing sink with no vanity to put your toiletries on. The housekeeping was lacking, and I did let the manager know this at checkout. He actually took a bit off of our bill, which was nice. If you stay here, you will still have to drive to downtown Frederick for restaurants, etc., but it is a quick drive. We stayed in the junior king suite which has a king bed and a foldout sofa. The room was comfortable and clean, but not as roomy as one would expect. The bathroom was very tiny with a toilet and a shower. The sink was outside of the bathroom which is nice if you have a few people in the room. The hotel staff was very friendly and went out of their way to welcome us. Free hot breakfast included cereals, toast & pastries, waffles, scrambled eggs, sausage patties, yogurt, bananas, oranges, apples, juices, coffee, tea & cocoa. This hotel has two floors and is tucked away in a quiet residential area, yet close to everything. 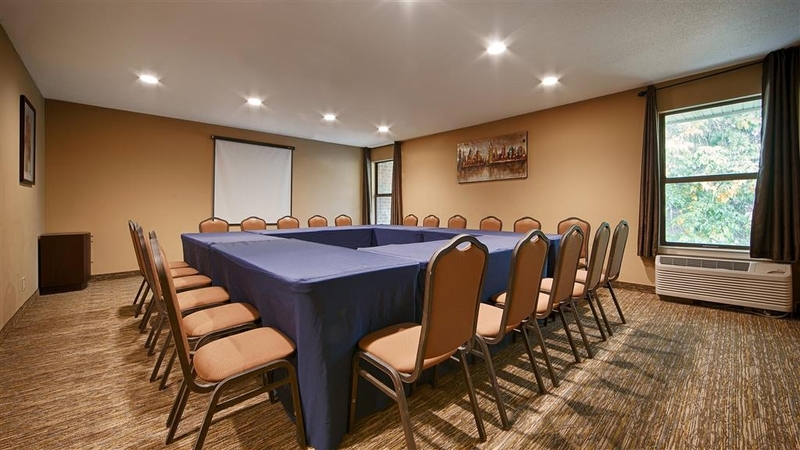 Convenient Location, helpful staff, clean room, complimentary breakfast not that great, hotel was crowded but not noisy, right off route 15 but close to downtown Frederick. Enjoyed Frederick, great town with great restaurants . Don't pass this value up. Room decor was up to date, mattress very comfortable, and came with breakfast. Close proximity to downtown Frederick (a mile) near lots of wonderful restaurants and boutiques. Will be back! "Best Western Historic Frederick MD"
This Best Western was everything you expect from Best Western. Clean, Comfortable, tasty breakfast items. Love their sausage gravy. Conveniently located near the historic area. Microwave in room, but strangely, none in the breakfast area to heat some of the items. The BWHF is top-notch. The room we used was tagged "handicap," and it was definitely set up for that. The breakfast area was pleasant. The food was great, and the attendants were quick to replenish. The staff were very supportive and congenial. The hotel overall was clean and pleasant. If we were to return to this area of Maryland, I wouldn't hesitate to book a room at this hotel. "Stay Elsewhere for a Good Night's Sleep"
We decided to stay at this hotel because of its location to a restaurant in historic Frederick. Our home is only an hour away, but we had a later seating and we didn't want to drive home after. Upon checkin, there was one young lady who was very pleasant, but alone and tasked with handling too much on her own. Not her fault. She did the best she could with no help. The hotel itself smelled musty. We were located on the first floor and the hallway way outside our room smelled of stale cigarette smoke. The room wasn't much better. It was a large room, but it too smelled musty, with a hint of old cigarettes. The bathroom was tiny, and there were stains on the bathtub and toilet. Wallpaper was torn. The bed was incredibly uncomfortable. Woke very early with my lower back killing me. My girlfriend had a rough night as well. We left immediately for home. This stay at a Best Western facility was very satisfying. The room was excellent; sleeping accommodations were wonderful...slept (6) straight hours...hopefully not only the Oktoberfest food and beer! I had a wonderful time overall...even though in rained. Made new friends and will definitely be back next year.. Stayed while on a bicycle tour. The hotel always feels crowded; everything just a little smaller and tighter than it should be. Room was clean and functional, including an adequate and moderately quiet AC/H unit. Bathroom was tiny. Breakfast was above average with good variety. Pool was closed. I stayed here for two nights [which were no nearly enough for this part of Maryland]. I have come to expect cleanliness from Best Western and this hotel did not disappoint. It was in a good location next to a grocery store and not too far from the center of town. The freeway traffic was a little noisy but that's what you get when you stay this close to the highway. Breakfast was good and the desk staff was friendly and helpful. I would stay here again! Just to note though it does not have an elevator so disabled people should request a ground floor room. "Great Value - Nice Hotel"
Stayed here a few times while visiting family in Maryland. The hotel is clean, the rooms are roomy and breakfast is good. My only issue is the size of the dining area. Its too small for the amount of people eating breakfast, otherwise we were very happy with our stay. I would recommend this hotel to anyone visiting the Frederick area.